The City of Albuquerque will for the first time offer pickleball lessons! 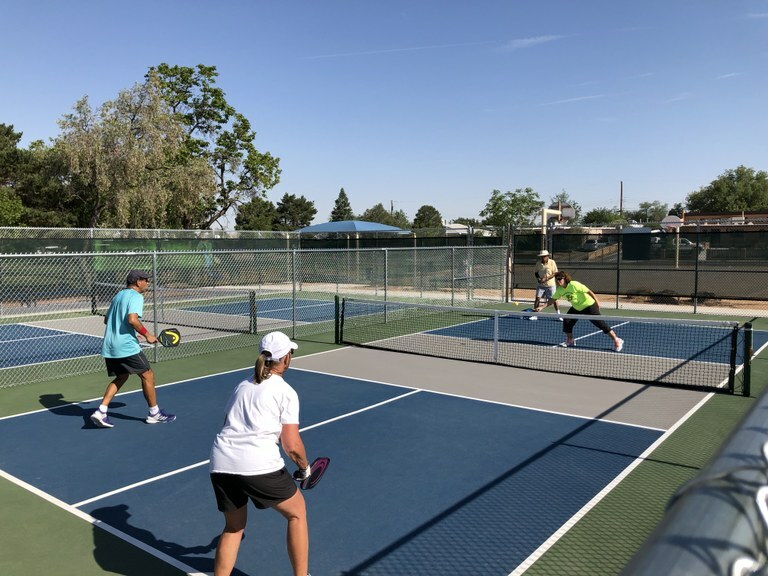 The City of Albuquerque’s Parks and Recreation Department offers pickleball lessons to Albuquerque residents for the first time. Albuquerque, NM – The City of Albuquerque’s Parks and Recreation Department will for the first time offer pickleball lessons to Albuquerque residents beginning June 18, 2018 at the Manzano Mesa Pickleball Complex. Pickleball is a fun sport that combines elements of tennis, badminton, and table tennis. The City of Albuquerque has dozens of public pickleball courts for everyone’s enjoyment. Albuquerque residents can register for one of three sessions, which consist of 10 lessons over a two-week period. Lessons will be offered for beginner, intermediate, and advanced levels. Class sizes will be limited to eight students per class, so residents are encouraged to register early to ensure their spot in the class. Registration is available online at play.cabq.gov or in person at the Jerry Cline Tennis Center located at 7001 Constitution Ave NE. *Lessons will take place Monday through Friday at 8:00 a.m., 9:00 a.m., and 10:00 a.m.
For more information on pickleball lessons, please contact Nicholas Romero at 505-224-6682 or [email protected]. Learn more about pickleball and locate a pickleball court near you.